Yet as much as I found myself disgusted with the girls’ antics, as I continued to read, I also realized how judgmental I was being. It reminded me of an article I read called “The Girl Myth in YA Fiction (And Beyond),” which I highly recommend you read here. It had always bothered me that even the worst of male characters, if they were charming, could be loved for their complexity (the bad boys definitely have a fan base) while female characters who are imperfect are more often summed up as unlikeable or not relatable. So at this point, my rational thought process hit a wall, or rather, a loop. I had judged the book and its characters, become self-conscious about my judgment, tried to consciously resist playing into a type of binary thought about female characters that hurt feminism, and then wondered if I was just overthinking it. I don’t want to perpetuate this kind of oversimplification of young women, but I also believe that as a reader, I have the right to like, dislike, and judge novels as they affect me. A reader’s interpretation of a book, in my opinion, is the most important part, and I found Dirty Rush lacking in some senses. I was torn between relating to and believing the characters one moment and disliking the simplistic judgment of flat characters the next. Even within the book, there existed the protagonist, the girl who over and over claimed not to be that kind of sorority girl, and her friends, developed, (mostly or comparatively) righteous characters. And then there were all of the other girls, who were villainized and flattened because they did not fit into those two categories. Their complexity was ignored. 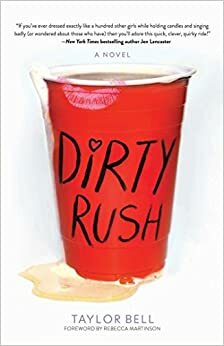 Obviously, Dirty Rush is more of a light read for entertainment value than the kind of fiction that people take seriously or to heart (I hope), but it is a type of literature nonetheless, and I can’t say that there weren’t aspects of it that I enjoyed. But I do feel that this book perpetuates a problem with the portrayal of binary female characters. I’m curious; have others encountered this kind of binary often or exceptions to it? I see this in both the way in which female characters are judged in books as well as the way in which women are judged in life. I’m not sure if this is art imitating life or life imitating art. Perhaps a bit of both. The hopeful news is that I’m seeing a lot more deliberate conversation about recognizing how we have incorporated these views and expectations into our culture with the intent of changing those views. Why do we talk about ‘chick lit’ (a belittling term) but have no categories for male fiction? Does it not seem inequitable that Joanne Rowling became J.K. Rowling because her publisher thought boys would be less likely to take interest in a book written by a woman? The terms we use and attitudes we share become ingrained at a young age. It can be difficult to break those habits. Keep the conversation going! I love this – very Insightful ! !